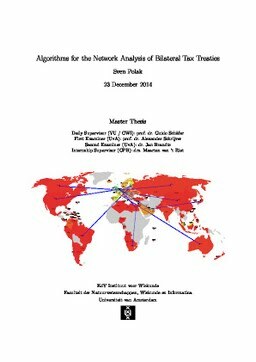 In this thesis we conduct a network analysis of bilateral tax treaties. We are given tax data of 108 countries. Companies often send money from country to country via indirect routes, because then the tax that must be paid might be lower. In the thesis we will study the most important of these ‘tax’ routes. Questions that we will answer are, for example: 1. Which countries are the most important ‘conduit’ countries in the network? 2. How can a country maximize the amount of money that companies send through this country? The thesis is mainly theoretical: the focus is on the mathematics and the algorithms used for the network analysis. At the end of each chapter we apply the algorithms to the CPB-network of 108 countries. The thesis is a collaboration between the CWI (Centrum voor Wiskunde en Informatica) and the CPB (Netherlands Bureau for Economic Policy Analysis). Polak, S.C. (2014, December). Algorithms for the Network Analysis of Bilateral Tax Treaties. UvA Master Thesis.